This post brought to you by Campbell’s Soup Company . The content and opinions expressed below are that of The Country Chic Cottage. That big football game you have been waiting for all year is coming up. If you need a unique, easy, knock their socks off snack, try our loaded steak fries recipe. 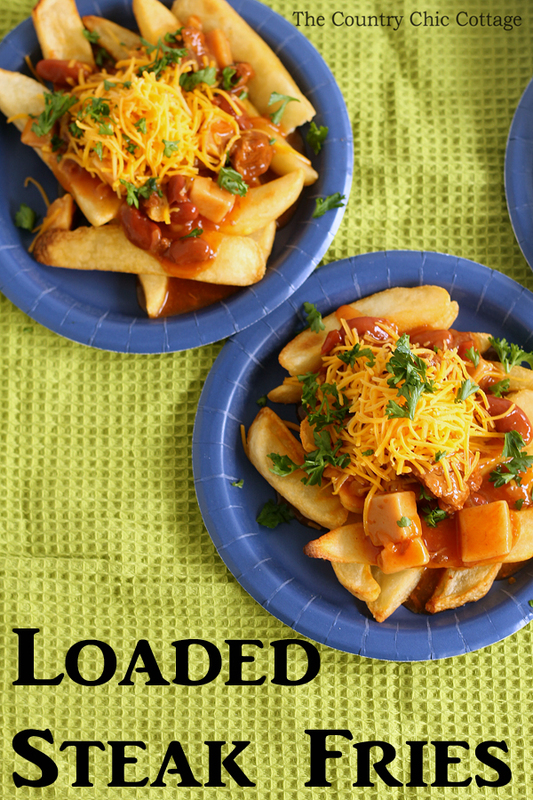 Every guy and gal at the tailgate party is sure to love these meaty, cheesy fries. The main ingredient in these great fries is Campbell’s Chunky soup. It does not get much better than the new variety of soups that they have out. The BBQ seasoned pork variety used here really makes these fries delicious. You can also get more delicious Campbell’s recipes if you are looking for unique ways to serve up any Chunky soup variety. Bake your steak fries according to the package directions. Salt if desired. Heat Campbell’s Chunky soup according to package directions. Serve up individual portions of steak fries topped with a ladle of soup, shredded cheddar cheese, and chopped fresh parsley. Serve these up to any football fans in your house. Yes this recipe really is that easy y’all! Don’t spend your time on game day slaving away in the kitchen! 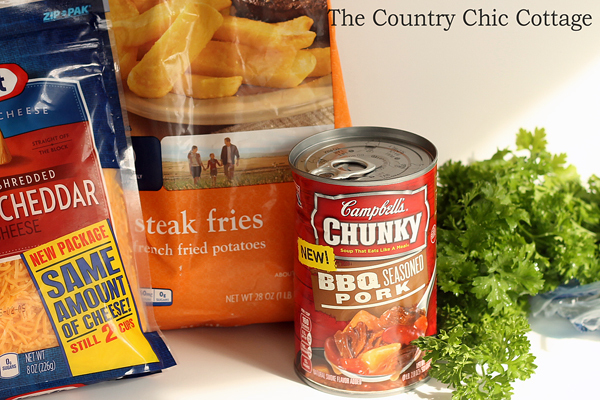 The new varieties of Campbell’s Chunky soup leave you with so many options for topping steak fries, mashed potatoes, rice, and so much more. Reconsider your game day plan with these delicious Campbell’s recipes. 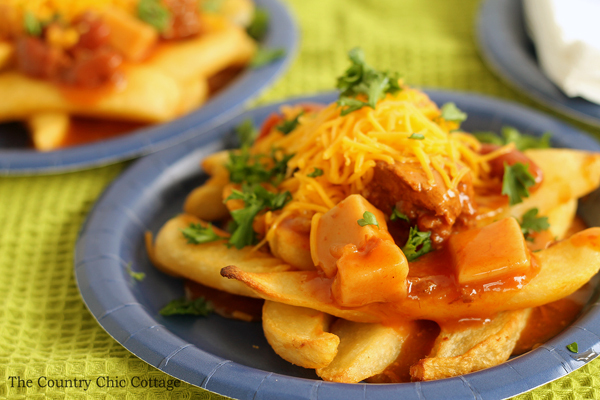 You will also want to add our loaded steak fries recipe to your football party menu. 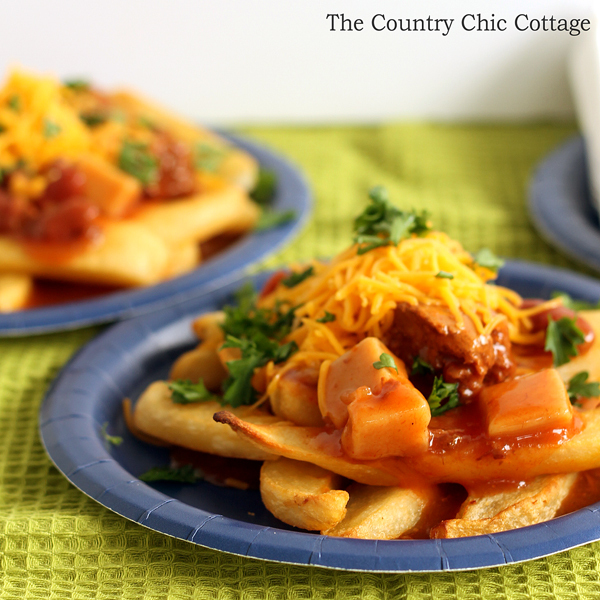 Guys and girls alike will love these hearty steak fries as a game day snack or a stick to your ribs lunch. Be sure to add this super easy recipe to your cookbook for party food ideas. You can also follow @CampbellsChunky on social media for tons of great recipe ideas and more! What a great comfort – game -day recipe! What a great idea, your Loaded Steak Fries look awesome! Hope you are having a great weekend and thanks so much for sharing with Full Plate Thursday. Oh wow – how great does that look?! Sounds like a crowd-pleaser and so easy to make.